It's not perfect and you can't get it yet but Android Wear can support iPhone notifications. 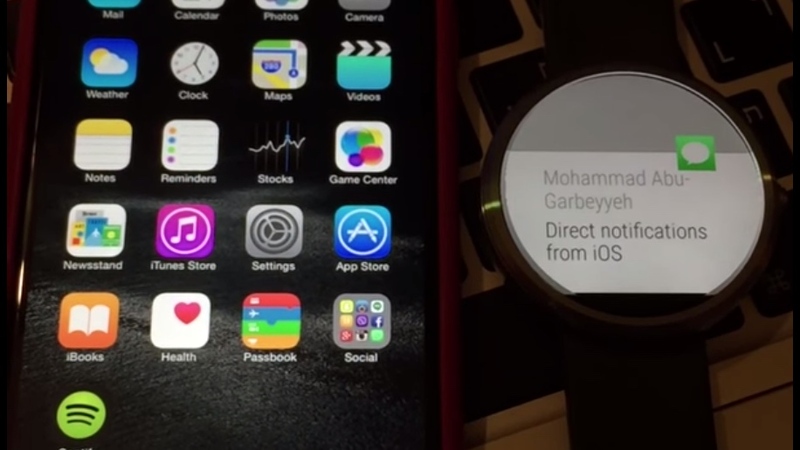 A developer, Mohammed Abu-Garbeyyeh, has uploaded details of a hack to YouTube showing how he's managed to get iPhone alerts on a Moto 360 smartwatch via Bluetooth. He hasn't made the code available. So while we know there's no jailbreaking or rooting involved, Abu-Garbeyyeh hasn't told us exactly how he was able to modify Android Wear to support ANCS (Apple Notification Center Service). Unsurprisingly, Google Now and apps are out once iPhone is in. We've seen a couple of good Android Wear hacks in the past six months - Corbin Davenport even went so far as to get Windows 95 and Minecraft running on his Samsung Gear Live. With the Apple Watch due in April, we're unlikely to see Apple officially open up iPhone notifications to Google's smartwatch OS. That doesn't mean Google isn't interested. Android Wear product manager Jeff Chang recently said: "We always want as many users as possible to enjoy our experience," Chang said. "So in terms of enabling more people to use Android Wear we're very interested in making [cross-platform support] happen." "It's not always completely up to us right? There are technical constraints and API constraints so we are trying really hard," he added.